Bored at work today? Feel free to give your fingers some exercise with Google’s latest invention – Super Sync Sports. It’s a web application that syncs your PC Chrome browser with that of your mobile to let you participate in running, cycling, and swimming activities. That may sound semi-boring at first, but when you watch the preview below and then head over to the site to take in the soundtrack, you’ll find an urge to play immediately. 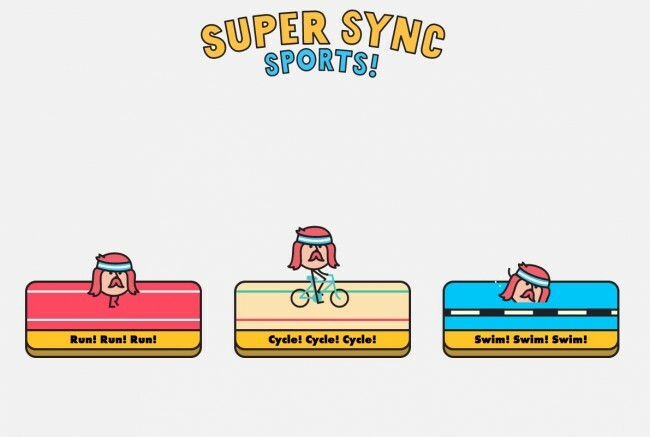 Once you sync browsers, you get to pick from 50 different “athletes” to either battle the computer with or to take up against three friends. From there, the activities require you to perform different motions on your phone in order to make your character either run, bike, or swim on your PC browser. It’s addicting. Go get some. To play, head to this link on both your PC Chrome browser and the mobile version on your phone. Once there, you’ll be guided through instructions how how to sync between the two using a password. From my experience, it does not require a WiFi connection.